Ensuring long-term corporate growth and achieving sustainable profitability represent the primary goals of most companies. To achieve this goal steady customer acquisition and high customer loyalty provide the basis for any business’s success. The digital transformation and especially the ever-increasing popularity of the internet continuously provide a huge growth potential for companies, that should not be untapped. The Genration Y (those born between 1980-2000) constitutes the main target audience of potential customers for online products and services. They spend in average four to six hours per day online and can easily be reached through advertising messages across various online media outlets but especially through social media. 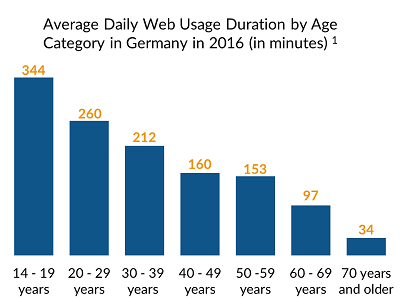 Nevertheless, the internet also provides numerous opportunities for older generations making everyday life easier for them. Consequently, the range of new potential customers is wide. Companies in nearly every branch and industry have no alternative to using the growth opportunities of the internet through professional and strategic online marketing. After a robust growth in online marketing over the last 10-15 years, the importance of online advertising still increases rapidly. 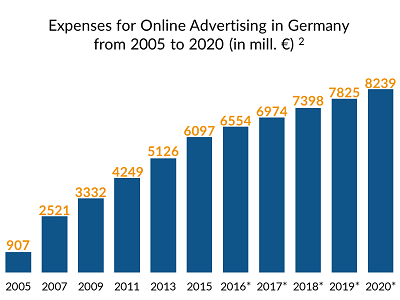 The investments in online advertising in Germany have been increasing continuously for years now. According to forecasts, they will further rise over the next years. Companies, which do not invest in online marketing, risk to be left behind by the digital competition. Market leading companies, such as Amazon, Ebay and Zalando, have a crucial advantage over middle-sized online-advertisers and start-ups: They have control over sophisticated technology and established efficient internal processes in their online marketing departments, which allows them to extend their wide reach continuously. New customers are steadily acquired and long-term loyalty of existing customers is being gained. 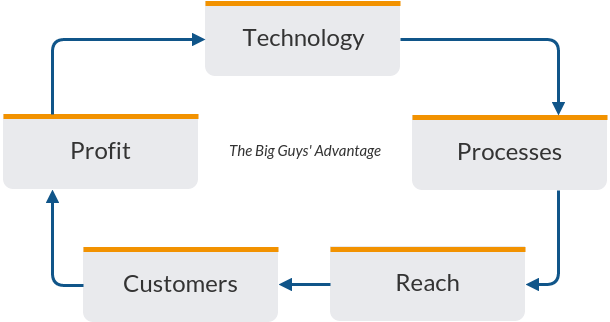 Consequently small- and mid-sized companies and established brick-and-mortar businesses have been losing market share to these “Big Guys”. The Big Guys reinvest their profits into the continuous development of technologies and processes, in order to further extend their enormous market power. 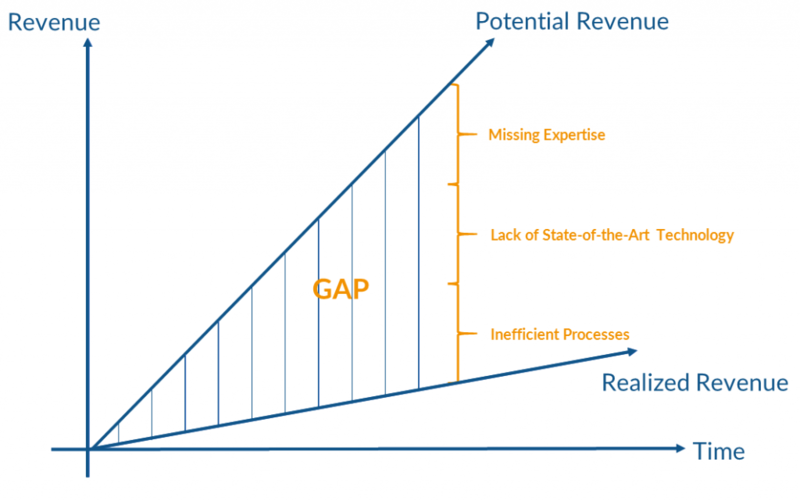 How can Mid-Sized Companies Close the Growth Gap? Start-ups and mid-sized companies have a strategic disadvantage competing with the Big Guys, as they often neither have the right technologies or the digital, efficient processes, nor the needed expertise at their disposal, in order to fully exploit their growth potential. Maintaining the status-quo and continuing to work without changes is an option, but not a good one. The problem is, that the company’s potential is not fully exploited, which leads to growing gap between potential and realized revenue. A business’s demise is inevitable, if it does not adapt to the digital transformation. Looking for solution inhouse: Many companies try to build solutions and technologies in-house and seek to acquire knowledge exclusively internally. However, this approach is often lengthy and expensive. Furthermore, success is not guaranteed, as qualified employees need to be found, and developing technologies in-house requires long development cycles not to speak of the complexities that are often underestimated. Accepting outside help: Accepting the help from experienced companies and collaborating with a professional partner, who has the needed knowledge about technologies and processes is usually the best way to close that “gap” quickly. We at Applicata, can support you in the areas technology, processes and expertise. Our goal is it to decisively help our customers closing their strategic growth gap. Technology: As a Software-As-a-Service company Applicata offers an integrated marketing controlling solution for central planning, controlling and optimization of every marketing activity. With Applicata you centrally manage all your marketing activities for every website, in every country and for every marketing channel. Processes: Clients employ the Applicata software as their centralized campaign management for every marketing channel based on a comprehensive aggregation, consolidation and transformation of all relevant data. Further, Applicata facilitates full cost control for all online marketing expenses through automated cost calculations and cost analyses. Know-How: More than 20 years of work experience in the areas of Business Intelligence, Online Marketing, Data Science and E-Commerce and thousands of developments hours have been combined in the Applicata software. Additionally, we assist our clients in an advisory capacity with a dedicated project manager who also supports the technological implementation and user training. The enormous opportunities which the shift online provides should not be limited to the Big Guys. Applicata’s goal is to democratize online marketing: Small- and mid-sized companies are supported by technology and expertise in business intelligence and online marketing, so that they assert themselves against the Big Guys.